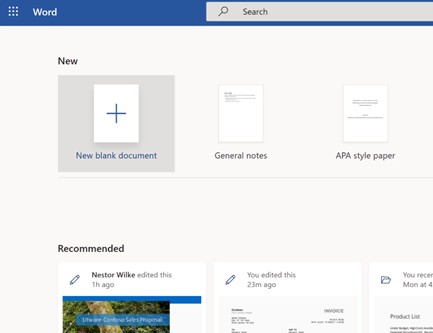 Create documents to add and format text, images, and page layouts. Get to your documents from your computer, tablet, or phone. Share and work with others, wherever they are. This Quick Start is for Word Online. For the desktop version of Word for Windows, see the Word Quick Start. For Word on a Mac, see the Office for Mac Quick Start Guides and Word for Mac Help. Select the Office 365 App Launcher and then select Word. Select New blank document, open a Recent file, or select one of the templates. Select the title at the top and type a name. Your changes are saved automatically in Word Online. Note: If you can’t edit the name, you might be in Reading View. Select Edit Document > Edit in Browser.